Denise Lewis was inspired to become an Olympian at just eight years old as she watched the Moscow Olympics in 1980. She was so enthralled by the performances of Daley Thompson and Sebastian Coe that she vowed to make it to the Olympics one day and be the best in the world. 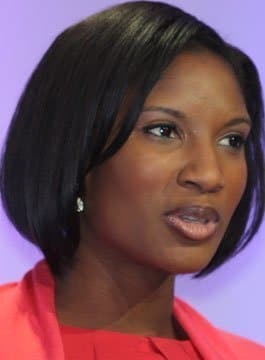 Two years later, Denise Lewis won a Bronze medal in the Atlanta Olympics, the only British female to win a medal in these Games and in this same year broke the British record that had stood for ten years. Denise was awarded an MBE at the beginning of 1999 and later that year won the silver medal at the World Championships in Seville. She broke her own British record again in 2000 but the highlight of Lewis’ career came at the Olympic Games in Sydney when despite an injured Achilles tendon Denise went on to win the heptathlon making her only the 6th British woman to win an Olympic Gold medal in the history of Track and Field. Denise came second to Sir Steven Redgrave in the Sports Personality of the Year Awards, and early in 2001 she was awarded an OBE from the Queen. In 2004, Denise took part in the BBC One Dancing competition Strictly Come Dancing. Partnered alongside professional dancer Ian Waite, they made it to the final and were runners-up to Jill Halfpenny and Darren Bennett.